Unlike simple barcodes, passive RFID labels and tags allow item-specific information to be programmed directly on the tag—SKU, serial number, date and place of manufacture, date of shipment, etc. When individual products are source-tagged or embedded into products at manufacture, this degree of information delivers near real-time item-level visibility and asset protection simultaneously. In essence, you are creating smart products that feed information back into your existing systems. OPP4215 RFID Tags that Beat the Heat! Need to track assets or machines exposed to extreme heat, high pressure or corrosive chemicals? OPP4215 is a perfect RFID tag for you. OPP IOT found the marketplace was in great need of a tag that could survive repeated exposures in high temperature settings such as automotive paint booths, medical autoclave sterilization and manufacturing operations. The only available RFID tags on the market were, and continue to be, too large and bulky for most use cases, too expensive for large deployments and generally unreliable with an inconsistent resistance to high heat. OPP IOT provides a RFID tags designed specifically for high temperature environments reaching 280°C. These products address the critical needs of customers with their combination of a small form factor, read range up to 7 meters and high temperature survivability – all at a very competitive price point. Author rfidchip_@2016Posted on June 22, 2018 June 22, 2018 Categories application, RFID TagLeave a comment on OPP4215 RFID Tags that Beat the Heat! When you’re mounting RFID tags on metal surfaces or metal products, you should be aware that if you use non metal mount RFID tags, your system will not function as desired as the metal will detune any passive RFID tag that is not designed to be placed on metal. Using OPP130 long range RFID tags that are specifically calibrated to the materials you need to track makes reading, tracking, and inventorying them easier and provides for greater read range(reading range up to 30 meters). Metal mount RFID tags OPP4215 are typically rugged, difficult to damage, and easy to weld, screw or otherwise attach. 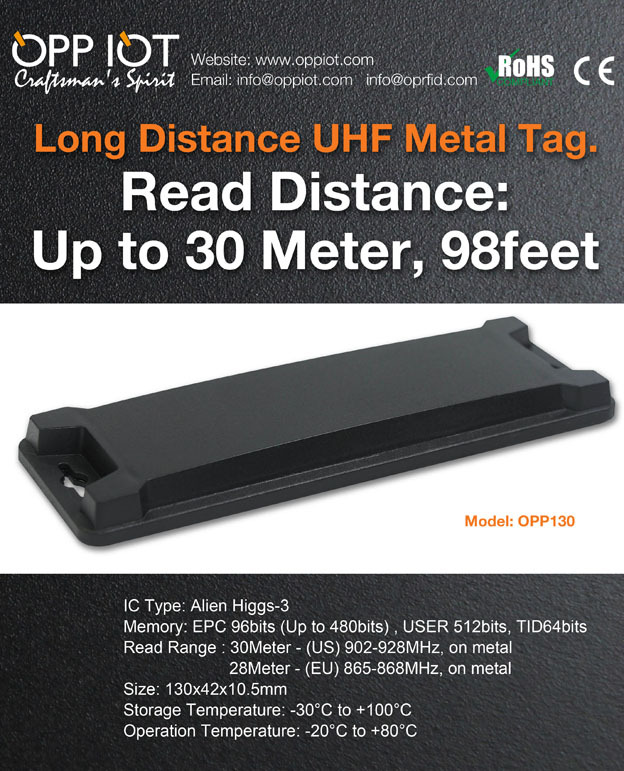 The Long range RFID tags OPP4215 are highly durable UHF radio frequency identification (RFID) tags that can be mounted on metal surface and supply long read range. The Tags are the most advanced general-purpose UHF RFID tags available. Multiple options are available to affix and mount the tags, while enabling read ranges of up to 10m. 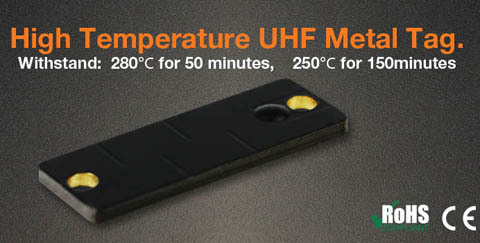 The UHF RFID Tags are compliant with EPC global-certified UHF Class 1 Gen 2 (ISO 18000-6C) readers and modules, with broadband capability for international operations. Metal tray and metal hatch box management, good performance, strong and durable, stable installation does not fall off. Electronic product production line tray management, can withstand high temperature reflow, high temperature baking, ultrasonic cleaning. Management of metal shelves, small size label, high strength, reading distance. Management of metal bed, metal stool, metal assets, label size is small, strong and durable, it is difficult to illegal removal. Management of metal fixture and metal fixture, small size, excellent performance, long life. Management of engineering vehicles, forklifts, labels durable, good weather resistance, good read and write performance. The FPC RFID Tags OPP7111 is a flexible RFID transponder adopting RFID chip in SMT form and high-temperature resistant polyimide(PI) as substrate, and printed circuit as antenna. It combines the merits of flexibility, high temperature resistance, stability and flexible. Especially suitable for second time packing, e.g.., integrating with rubber and silicone material, in which process high temperature and flexible structure is demanded. It can be used as semi-product for second time packing, and also can be taken as finished RFID transponder. 4.solid — resistant to bending, rubbing, etc. 5.easy to mount — adhesive backing is optional, can also use glue to attach to the objects.